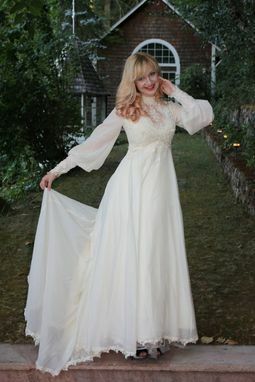 Absolutely stunning vintage couture wedding gown made of a silky base with a silk chiffon overlay, and sheer silk chiffon bell sleeves. The bodice is fully appliqued with gorgeous floral pieces of Venise lace, with a deep scoop neck with sheer tulle over the bust and upper neckline that features heavy embroidery up to the neck. 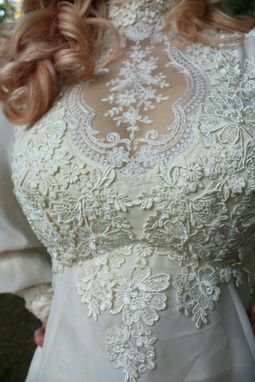 The high collar is also heavily embroidered in Venise lace, and closes in the back with hook and eyes. 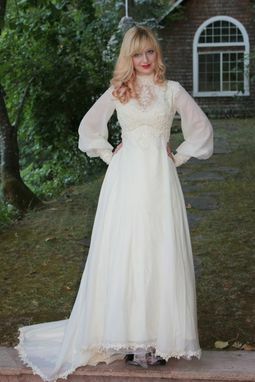 The cuffs of the bell sleeves are also appliqued in the same beautiful Venise lace. 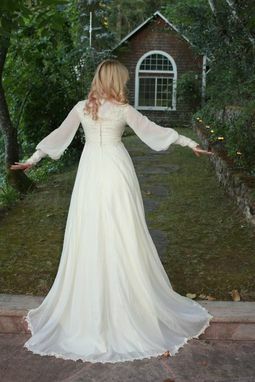 The skirt flows down from the lace bodice in a double layer of silk chiffon. Each layer of the skirt has a hem trimmed in matching Venise lace. The train has little thread loops along the back, and hooks at the back of the waist to hang the loops so that the train can be fully bustled in three ways so you can dance without having your train in the way. 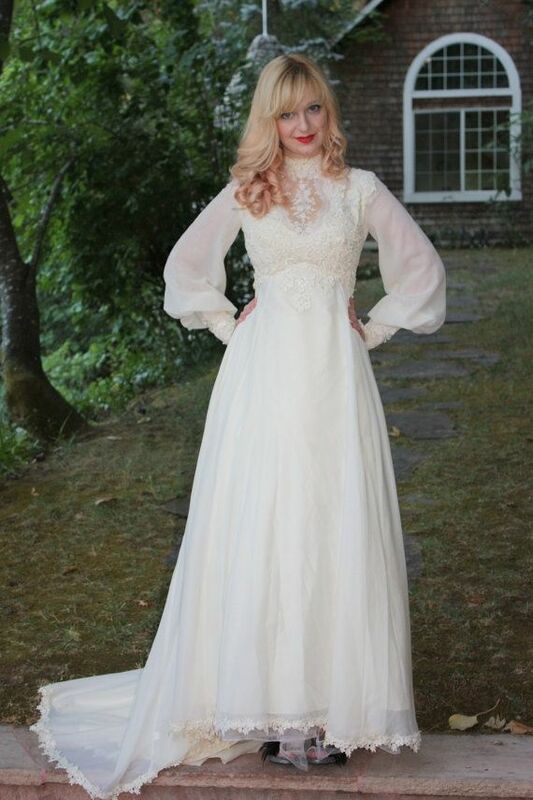 The Dress is in excellent vintage condition with no stains and no holes anywhere on the dress. It zips up the back. If you prefer a modern look, I will happily remove the sleeves. Skirt Length - From Small of waist 41.5", Train From small of waist in back 58"